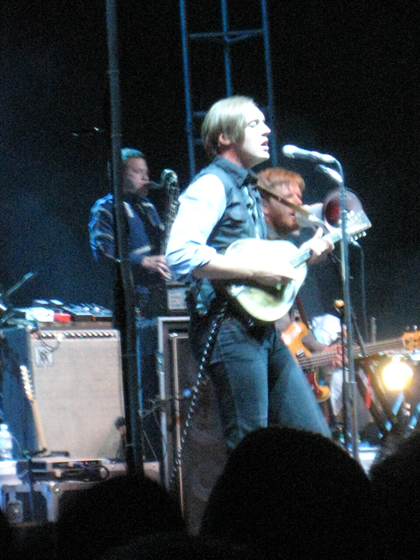 I’ve seen Arcade Fire in concert twice now. Once in 2007 and once again last week. Both times were incredible performances. So here’s a photo and snippet montage of both shows [since I never formally blogged about the first show almost 4 years ago]. 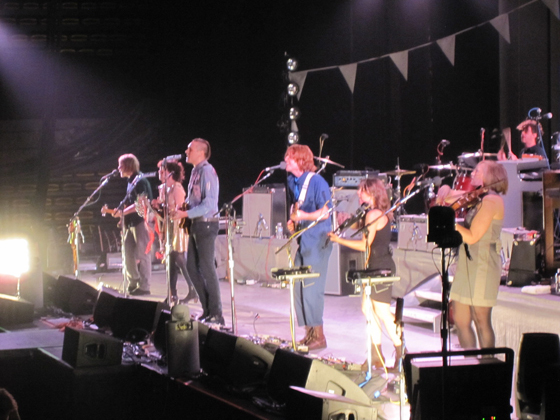 My daughter introduced me to Arcade Fire’s music with their first album, “Funeral.” And to be honest, it was good, but it wasn’t until 2007’s “Neon Bible” where their sound really caught on for me. So by the time September of that year came around, I was psyched to see this cool band from Montreal Canada. 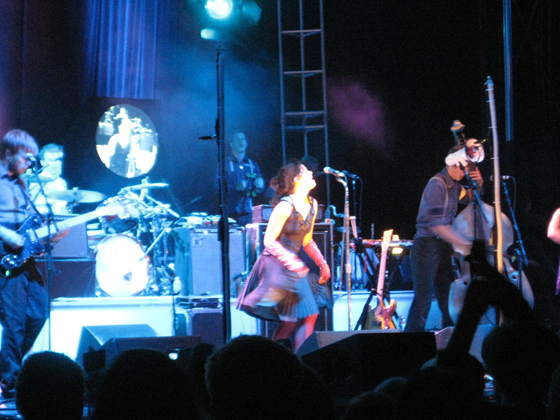 Win Butler and his wife Regine are the leaders here of this eight-piece outfit. Regine’s vocals are quite unique, with some sustained power that draws you in. The show was held outdoors at the waterfall area of Thanksgiving Point, a garden area located 30 miles south of Salt Lake City. It’s hard not to focus on Win when he’s singing. 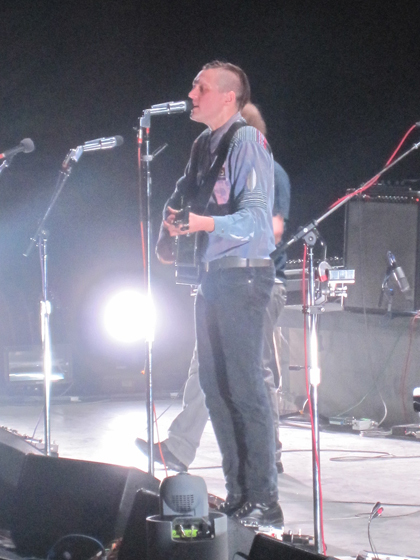 He commands the stage like the front man he is, albeit in the most humble way. After the show, we were waiting to see if the band would come out. Instead, the group of us were directed to follow one of the stage hands. Next thing we know, we are indoors at the meet and greet with the band. I don’t think we were supposed to be there, but no one said anything. 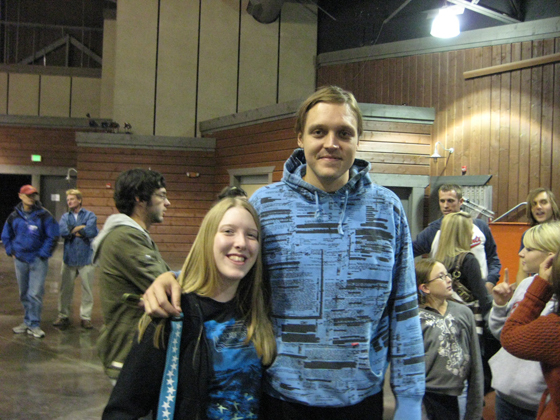 Which gave us a great chance to chat it up with Arcade Fire and have my daughter’s picture taken with Win. 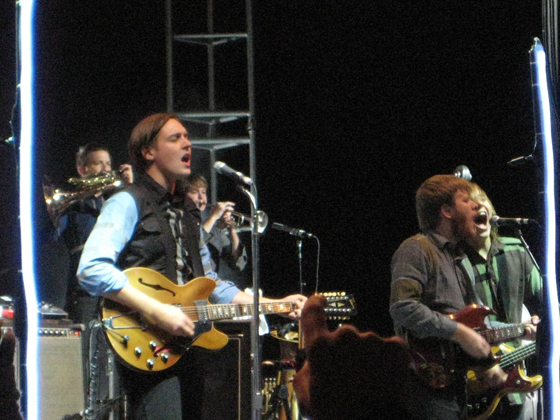 Fast forward a good three and half years and another albums under their belt and Arcade Fire found their way back to Utah. This time as Grammy winners for 2010’s “The Suburbs”, which easily made my best of list. The show was a bit on the short side (just under 90 mins) but still powerful. Songs from all three albums were played and once again, Win commanded the stage in his own way. He even forgot the lyrics to part of the song “Suburban War”, which was easily excusable and even quite funny [Win charmingly laughed it off]. 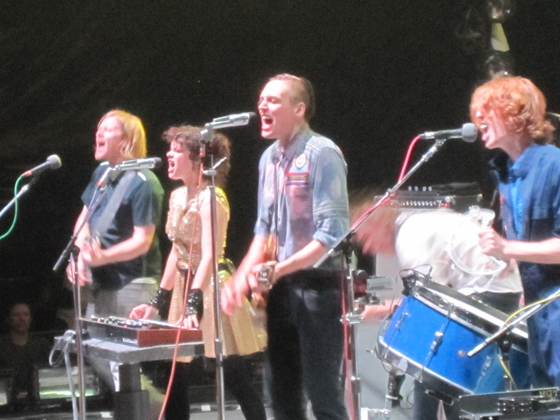 Harmonious vocals is what makes Arcade Fire’s sound so compelling. And their ability to switch instruments throughout the show was equally entertaining. Unfortunately, we weren’t able to meet the band again this time around. Different venue and different rules. If you get a chance to see this band in concert anytime soon, you should. Get to know their music if you’ve not already heard it. While it may not catch on for some, others will find it great and know why the rest of us like this band. Awesome that you got to meet them! 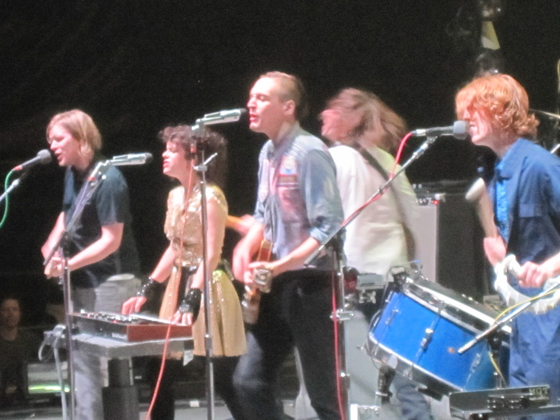 I like Arcade Fire, but I don’t LOVE them. Still – they’re definitely unique and talented. Cool. Nice to know you are a like fan. They are very talented, that’s for sure. Good lord, I’ve just realized I haven’t been to a concert since December of 2009. Must rectify that. Wow, that’s a long time for a music fan like yourself. Who was the band you saw in Dec 2009? That pic of Tiffany with Win is great! Jeez, if I were her I’d frame & put it up somewhere. Very cool! Thanks, Cath. It was a great photo that I’m glad I was able to get that night. Tiffany has met several of these bands she likes. Now for the chance to meet Depeche Mode…. that’s the day I will capture for sure.